People possess different personalities, some are introvert while others are extroverts. However, kids, I guess, are always extrovert because they love to talk and express their emotions. Also, their thoughts are pure and innocent. Therefore, I love being surrounded by kids in my family. I have 5 little cousins who I love and cherish the most. Aanvi, the youngest of all, is my favourite because she is a complete entertainment package. 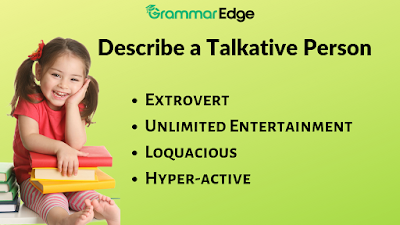 She is a loquacious and hyper-active child. I know her since she was an infant and I have seen her growing up to be a smart, active, studious and talkative girl. She is always charged to talk about anything and everything. Whenever I come home from office, she comes running to me and hug me. Then we sit and she tells me stories of her school, friends and teachers. She likes to be listened to and when I don’t pay attention, she drags me and forces me to listen to her. Sometimes, she showers me with abundant kisses when she is happy. I love listening to her because, in her presence, I forget about my worries and stress. She makes me smile. I wonder how perfect and honest she is. I always pray that she stays the same all her life spreading smiles and happiness.